Last Chance for Tickets for Book Club Night! Get Your Tickets for Monday! Larry is warming up for his presentation to book club members on Monday evening, September 18th, from 7-8:30 p.m. Check out the piles of books he's ready to talk about, And that's only part of his selection, there's another box in the back! Here's a quick preview of a few of the books that Larry plans to feature on the night. Literary history reigns supreme in this page-turning, tempestuous Viking saga, in which a brother and sister struggle to fulfill the roles designated to them in the brutal and bloody early Scandinavian society. Reminiscent of Bernard Cornwell and the first in a trilogy that I look forward to reading. A fascinating account of the life of a major world leader and remarkable woman that we in the US often know very little about. From a bleak childhood in East Germany, Angela Merkel has become one of the most--if not the most--powerful women in the world. Qvortrup is a political commentator and journalist and his account blends Merkel's personal story with post-WWII European history. This literary novel, with beautiful writing and brilliant storytelling, posits that early genius does not always lead to a happy life. What happens when you achieve all your ambitions early? A deeply moving novel touching on personal relationships, alcohol, family interactions, relations with colleagues, relationships and the curiosity of an outstanding mind. Including history, cultural conflict and women's rights, this has been one of my favorite historical fictions for years. This account of America's western migration through the eyes of a white woman and Native American has been around for 20 years and remains one of America's favorite book club books. The brand new 20th anniversary edition features an excellent book club discussion guide in the back. Now is the perfect time to read it, because in September a second book in the cycle will be published and, having read the advance reader's copy, I anticipate it being just as popular, and just as good for book clubs. If your club likes mysteries, the Inspector Bruno series from Martin Walker is one of the better written light mystery series, that is not too shocking and dark. All are set in France, with wonderful, atmospheric writing and well-developed characters. This book is set in a small French town and centers on past life and a crime. Would you like to know more of Larry's book club favorites and discuss your own? Then book your ticket now at the store, by phone on (303) 759-1117, or by emailing us at info@thebookies.com. Did you know that we offer 30% off top local bestselling books? At the moment, we're offering 30% off a list that includes fiction like A Gentleman in Moscow, Glass Houses and Y is for Yesterday. Nonfiction currently 30% off includes Astrophysics for People in a Hurry, Hillbilly Elegy and The Book of Joy. The list is on display on our adult nonfiction shelves, or ask our staff! We're delighted to be working with the American Association for Teaching & Curriculum (AATC) whose conference will take place on Friday, 6th October at The Sheraton Denver Tech Center Hotel in Greenwood Village. The keynote speech on Friday night from 5-6p.m. is open to the public and will feature David W. Orr, Counselor to the President, Oberlin College, and Paul Sears Distinguished Professor of Environmental Studies and Politics, Emeritus, and author of Dangerous Years: Climate Change, the Long Emergency, and the Way Forward and Earth in Mind: On Education, Environment, and the Human Prospect. Tickets are still available for David W. Orr's keynote speech, and for the conference itself, but must be purchased by Monday, 18th September at the AATC's website: www.aatchome.org. Two more authors have signed up to join Nancy Oswald, Stephanie Santos-Grant, Mike Hamel and Dale Lovin at our local author event on Saturday, October 7th, from 2-4 p.m. 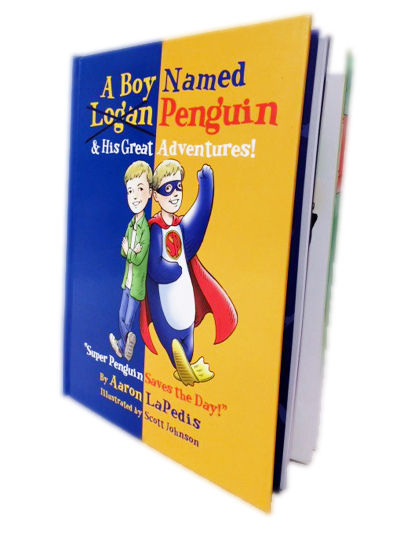 The adventure in Aaron LaPedis' colorful picture book, A Boy Named Penguin, is based on the techniques his own autistic son uses to navigate the world. You also may know Aaron as his alter ego, The Garage Sale Millionaire. We may be fudging the definition of "local" slightly, but we're delighted that Kathryn Otoshi will be in town and able to come to our event--and her books are certainly local favorites. Zero, One and Two make big issues approachable through confidence-building stories, that include counting and brilliant illustrations. Complete details of the day coming soon! Many years ago, Dona, a long-serving member of staff at The Bookies Bookstore and a former teacher, taught a little boy called Ben Blum. That little boy is now a lot bigger and is the author of a new memoir: Ranger Games. Dona caught up with him at a Doubleday publishing event in his honor and wrote a review of his book. "Ben Blum, who grew up in the Denver area, tells the compelling real-life story of a group of four trainee Army Rangers, including the author's cousin, Alex, who donned jeans and ski masks to rob a bank. "The news of the subsequent arrest shocked the respectable, intellectually competitive Blum family. "Alex was the most squeaky-clean, patriotic, rule-respecting kid we knew," writes the author, who digs into the case to tease out why an Army Ranger would do something so wildly wrong. Perhaps the heist was the result of a kind of brainwashing. The thought that the robbery was some kind of training exercise isn't as absurd as it might appear on the face: "As far as Alex was concerned," one of his fellow soldiers says, "it wasn't real." So what happened? "Blum's investigations led him to a study of sociopathy, odd-ball psychological interpretations, and family involvement in a multi-faceted story that ranges far and wide to answer that question." Blum's book is getting fantastic reviews. Congratulations, Ben, and we're charmed that Dona was the teacher you never forgot! We saw so many smiles at our fantastic afternoon with a Polynesian Princess from Wands and Wishes last Saturday. She sang, read a story and led the kids in an energetic dance.